take these chances: 10 things: dallas edition. Dallas. What's not to like about it? Well I can think of a few things. I'm also discovering many "loves" in this city. Here is my rundown thus far. 10. Dallas is not a college town. I love this! While there are several Universities in and around Dallas (UT Dallas, SMU, TCU, DTS, Baylor, etc. ), Dallas does not spring to life based on the constituents of these schools. It's nice to live in a city and not be assumed to be in school, even though I am. I am enjoying being an active member of a city, not just of a school. Verdict? "Like"
9. There are so many churches to choose from! College Station definitely had variety, but nothing like here. I could spend years trying to find one to get involved in. It looks like I'm going to just pick one that I know is good, and stick with it. Right now that looks like Watermark Community Church. I agree with their beliefs, like what I've heard, and have loved the messages on Sundays. They also have a large community of believers my age, and reach out to young adults on Tuesday nights at The Porch, drawing in many people who are not yet involved in church. I'm excited to be a part of this community. Verdict? "Like"
I feel like one word does this justice. I have never been anywhere that had shopping opportunities on every corner. Houston isn't even this exquisite! And much of it is very high-end shopping. I feel rich just walking around these stores. The first weekend I was here I needed to purchase some khaki pants and a couple of shirts to wear to my Observation Practicum (where I observe speech therapy), so I wisely headed up to the Outlet Malls in Allen, and bought everything I needed from Gap Outlet. My pants were $16, my shirts were under $25, and I threw in a cute pair of sandals for $15. Very reasonable. 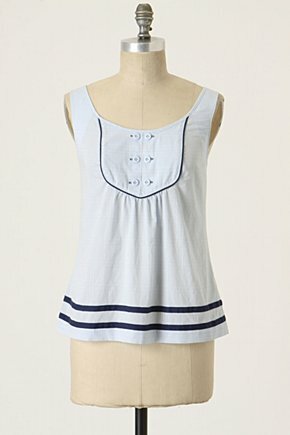 Well, I caved a couple of days ago and went to Anthropologie, which is one of my favorite stores, but not in my budget. Of course, I purchased something two shirts. I'm not going to post them because then you'll see how much they were. Oh, what the heck, I'll show you. They are so cute. 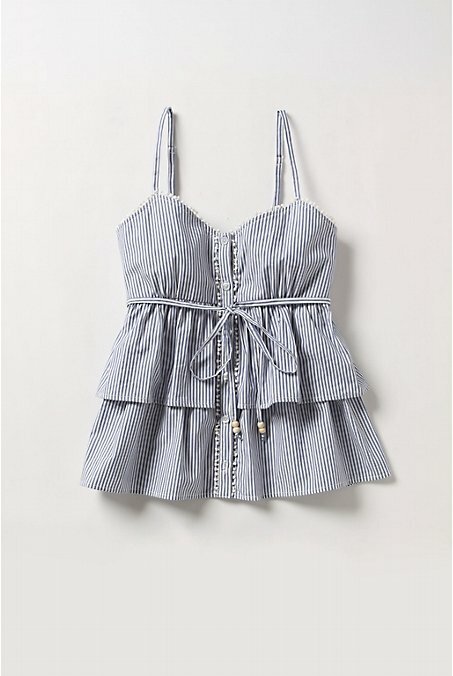 Apparently the second one is in the online section for "intimates," where in the store I thought it was a shirt. Oops. It's cute regardless. Anyway, I will not be shopping anymore, especially since I'm learning to practice living simply and radically so that I will have the opportunity to give more away to people in need. If you need to shop, however, Dallas is the place to do it. Verdict? "Dislike"
Along the same lines as the previous point, it costs more to live here than College Station, or even Houston. Everything is just a tiny bit more expensive. Probably because the atmosphere is so great and fun. Regardless, it's a shocker to spend 10 bucks on a movie ticket when I'm used to only dishing out 4. I have found ways around this, shopping at the Dallas Farmer's Market, cooking, packing my lunch, and limiting my entertainment (such as movies) for the weekends. But overall, I would have to say: Verdict? "Dislike"
While we are on the topic, I must say that I love the variety. After living in College Station for 5 years where the variety was limited, I have enjoyed having options to choose from. There are almost too many. I typically return to my favorite place over and over again, but with so many restaurants to pick from, I feel guilty not giving them a try. Verdict? "Like"
5. If you want to go out, you have to dress up. This is something that I have never understood (just ask my mother, who used to fight me tooth and nail to get me to wear something other than jeans and a t-shirt). College Station was a wonderful "transition" for me because frankly, I didn't have to transition. Jeans and t-shirts were everywhere. I am staying with a friend in Highland Park right now, one of the best areas of Dallas, and at dinner with one of her friends, I quickly learned the protocol around here. Madeline (my roommate) was saying how her daughter had left the house with her hair wet on a few occasions (there's something wrong with that? ), and her friend quickly agreed. She said to me, "I guess wet hair is better than dirty hair, but NEVER leave the house with your hair wet, and AT LEAST put some mascara and lipstick on. Then at least people will see that you've tried." I couldn't believe she was telling me this! My mom would probably say that she can't believe I needed to be told this! I guess this is innate knowledge around these parts. Needless, to say, I see the value in looking presentable while you're out. You never know who you will see (boss, clients, future husband, etc.). Two weeks here and I have never gone out with my hair wet (well, once I ran in to get a cookie after swimming). Verdict? "Learning to like"
4. Going out requires planning ahead. In College Station, just about everywhere I needed to be was 5-10 minutes away. This doesn't require much planning ahead, and it never required getting on the highway. Goodbye to small-town traffic and last-minute planning. Thankfully, Madeline knows all the back ways, so I really haven't experienced much traffic. I do, however have to leave 20-30 minutes before I have to be somewhere. Verdict? "Dislike"
3. It's like I'm a freshman in college all over again. I'm learning how to meet people again. It's odd to have to start all over. I have to remind myself not to get creeped out when strangers come talk to me. Everyone's a stranger! That's why we must talk - to meet people. We must be cautious, but not fearful. I'm rediscovering the joys of meeting new friends, building up acquaintances, and stepping out into new social settings. Verdict? "Learning to like"
2. With a new place comes a new culture. Add up all the points I mentioned above, and you get "Dallas culture." The people here tend to be pretty material, enjoy the comforts of living in a booming metropolis, and have a knack for fashion and good eats. Most of them also go to church. Enter someone who easily loves the poor, the strange, the tatooed, the weird, and the needy, and I feel lost. God is ironic, isn't he? Teaching me to love the people I find it hardest to love, and placing me in a situation where I will struggle to cling to Him. It's funny how He does that, but I am excited about learning to be "in" this culture without being "of" it. Two weeks here and I can already tell it's going to be difficult. But that is my calling. That is my mission. Like Paul said in 1 Corinthians 9:22, "I have become all things to all men so that by all possible means I might save some." Verdict? "Learning to like"
I have saved the best for last. Yesterday, Tiffany and I went and rode around White Rock Lake. I fell in love. There is a bike/run path that circles the lake, and there is no point where you are farther than about 50 yards from the shore, and often you are just a few feet away. One of the things I was worried about was that being in a big city would prevent me from being able to run and bike and be active outside. Dallas has actually proven to be a better place than College Station for this. What a blessing! I am a mere 10 minutes from the lake where I can either ride 9 miles around or 11 miles around. The lake path connects to White Rock Creek Trail that goes north another 7 miles. What a great ride! And all out of traffic. I plan on going back one morning or afternoon this week. Verdict? "LOVE"